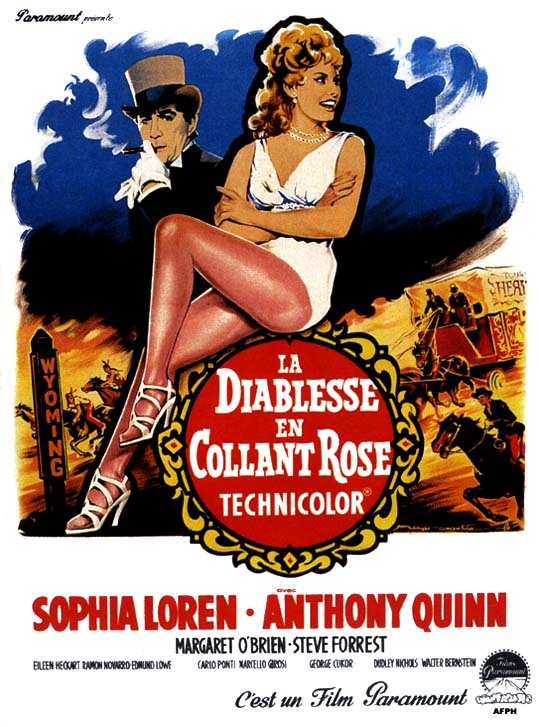 The stunning Sophia Loren teamed with one of my favorite leading men, Anthony Quinn for the third and final time in this odd entry in the career of director George Cukor. 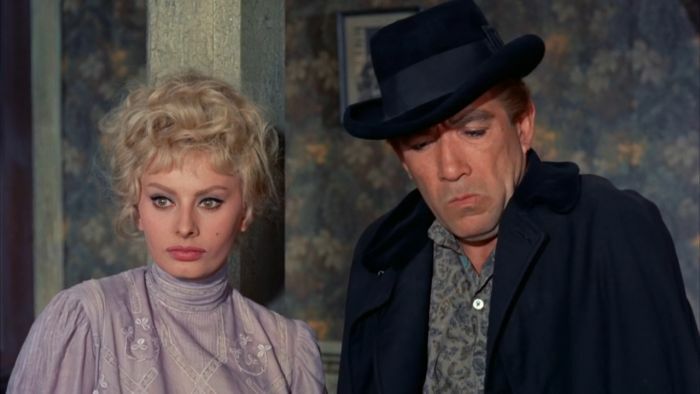 Though there is nothing wrong with this tale of an acting troupe making their way across the western frontier, it’s easy to suggest that both Loren and Quinn are somewhat miscast in this story adapted for the screen from a Louis L’Amour novel and produced by Loren’s hubby Carlo Ponti. Cukor’s western story isn’t of the town tamer variety that Quinn had just partaken in one year prior to this release with Warlock. This time out he’s the head of a travelling band of actors playing in shows from town to town and always stealing away in the dead of night from their debtors across state lines. His leading lady on camera and in the playhouses of our story is Miss Loren who continues to light up the screen with a smile and melt the coldest of hearts with a pout. She uses these attributes to great advantage in the film on Quinn’s behalf when it comes to the promise of favors over cash before they flee to the next frontier town. Other members of the traveling troupe include Margaret O’Brien as a young girl coming of age, Eileen Heckart playing her Mother while Edmund Lowe plays the senior parts of the plays they act in as they attempt to bring culture to the west. 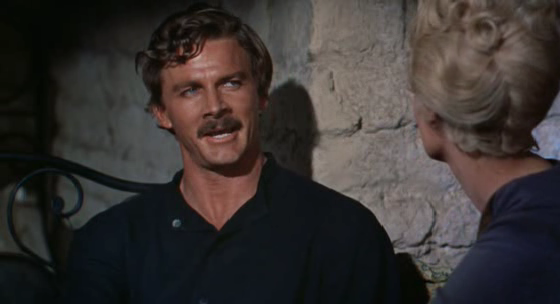 While we won’t see the many character actors here that populate the films of the genre, we will find Steve Forrest as a hired gun forcing claim owners into gunfights so land baron and former Ben Hur, Ramon Novarro can take ownership. Steve is going to be quite taken with Quinn’s leading lady and she plays him along till it’s too late. He beats her in a hand of poker after easily seeing her take money from the other players with her little girl like qualities throwing the men off their game. The stakes, his money if she wins, her virtue if he’s victorious. His four jacks are good and when Quinn flees the latest town with the troupe in the middle of the night, Forrest rides along. Good thing that he does as there are Indians on the warpath and Quinn isn’t exactly a fighting man this time out. While making their way to the next stop and home of Novarro, Forrest suddenly finds himself the hunted as his employer wants him dead so as not to have to pay his high fees for the killings he has carried out. When Quinn learns of the wager that Forrest holds over Sophia, Forrest may find he has another enemy to contend with. Can Tony face the inner truth and admit that Sophia is the love of his life and fight for her? For those looking for the action packed western tale, they’re likely to be disappointed with this one. I believe it’s the only western of Cukor’s career and because it doesn’t follow the familiar western themes, it’s easy to dismiss. That wouldn’t be fair to another fine performance from Quinn who continued to prove himself a worthy actor with this unlikely storyline. Forrest suits the western genre fine and would play opposite Elvis Presley in his best film this same year, Flaming Star. Fans of the Andy Griffith show may notice the name Howard McNear in the opening credits but you’ll have to look fast for Floyd the Barber in here and though I saw him, I’ll let you discover his appearance for yourself. Don’t blink! Looking gorgeous in various Edith Head costumes, Sophia had already appeared opposite Quinn in the 1954 Attila though she wasn’t on the same level as Tony just yet. 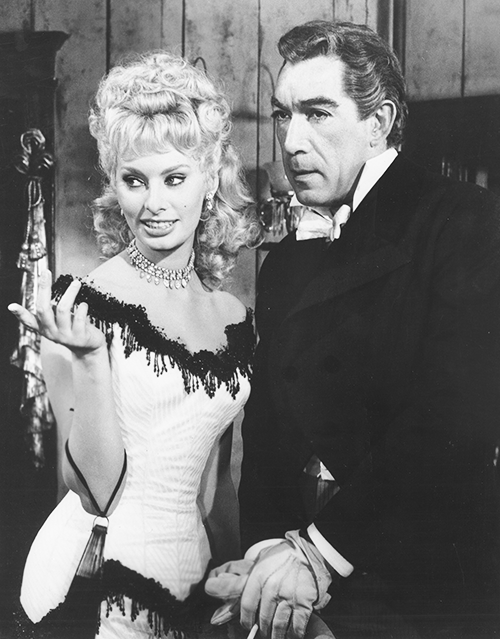 She would take top billing here and in their 1958 feature The Black Orchid. While they never made a bona fide classic together, I like them sharing the screen and it’s too bad they didn’t reunite later on like Quinn did playing Maureen O’Hara’s paramour in Only the Lonely. Cukor would continue to direct on into the 80’s though his mostly successful films were prior to this western feature. He had already worked with Quinn on Wild Is the Wind bringing Tony an Oscar nomination in 1957 and according to IMDB, he worked uncredited on the Quinn films, Lust For Life (Oscar for Tony) and Hot Spell. Looking for something a little different featuring Sophia and Tony enacting tales of Swords and Knights for the western frontier? Then this should work just fine. It’s an odd kind of movie on paper, isn’t it? 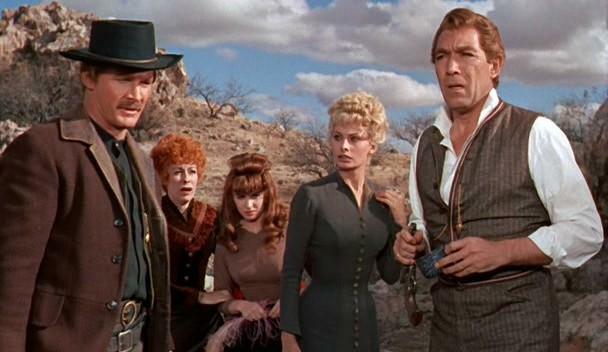 Westerns and Cukor just don’t seem to go together but it’s not a bad effort by any means. Louis L’Amour material usually gives a solid basis at least and then there’s the attractive but slightly unexpected casting to help things along. I quite like this film too, not any classic but different enough and good enough to keep me watching. I’ve heard of this one, but never knew a thing about it…and was surprised to read your review and find out it was a Western, from 1960, and directed by George Cukor! Yes, an odd choice of subject matter for Cukor…and I’m not used to seeing Loren as a blonde, either. Also, off topic a bit: considering the types of movies you and I like, and how much we both enjoy films of the 1970s and 1980s, I think it’s been quite some time since you’ve reviewed a film that I’ve actually seen! (I just did a quick check…the last time was about THIRTY films films ago!). I think the problem is, I don’t watch enough movies! lol. Get at it! Sophia as a blonde is a bit off but that smile and laugh pleases no matter the color. About to binge on Rutger Hauer films for a an upcoming idea on his VHS days. I’m sure you’ll have seen some of them. Uh oh…I’ve seen Blade Runner, Nighthawks, Ladyhawke, and if memory serves correct, The Osterman Weekend. If you end up watching any of those, I’d greatly appreciate it! lol. They weren’t on my list. Those titles would be more of a full post. I’m planning on something with a low budget flavor. I love Sophia Loren, so I will try and find this. One smile from Sophia brightens my day. I should have a clip of her on my computer to greet me at the office. This is out on DVD if you are so inclined. She’s a beautiful woman with a commanding presence. And a very good actress. I recently saw her in Two Women, which she won an Oscar for, and she so emotionally invested. A wonderful heartbreaking performance. That filmed proved she wasn’t just a pretty import. It definitely did. I always thought that she was a great actress but that performance was something else. So much love and pain in it.